Home » English Fluency at a Fast Pace! English Fluency at a Fast Pace! 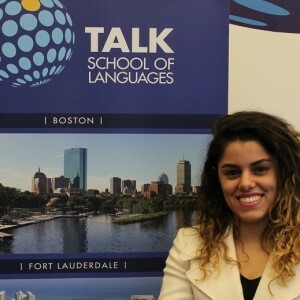 For Shenia Goncalves, who, with her husband, arrived in Boston a year ago, this time has been one of adaptation to a new culture that included learning a new language and quickly acquiring the skills that it takes for pretty perfect English fluency. Shenia gained Total English Fluency in just Six Months! Shenia continues: “I never thought about learning English. For me, it is the hardest thing I have done in all my life. “I can also talk with the doctor, without an interpreter, get my car insurance with an American company, or resolve some problems in my life. In general, I can live in an English-speaking world! It may sound easy and simple, but it is incredible to me! Thanks for this, Shenia. We can testify amazing English fluency and you have described your experience so eloquently using all the right expressions. We think you are an amazing learner whose skills are way above the average after 6 months. Living and functioning in English-speaking surroundings certainly accelerates language-learning. Congratulations on your incredible achievement!